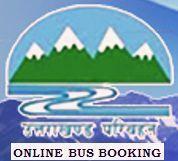 Uttarakhand Transport department has been also announced a new service of online Bus booking in Uttarakhand. We know that Uttarakhand is known for various tourist places. And every year many of the tourists and visitors are come here to visit the tourist places of Uttarakhand. And they are coming from many of the Indian states and also from foreign countries. So the main transport of the Uttarakhand is Trains and Buses and so that’s why many of the tourists choose Volvo bus but due to full seats or no availability in the Volvo bus they are disappointed. So now Uttarakhand Government has conduct the online Volvo bus booking service for tourists. Now it is easy to book your seats online on the Volvo buses in Uttarakhand. Because now everywhere and all the services are becomes online, link trains booking, flight booking and Cab booking etc. So you can check the availability of the Bus seats and book the seats as per your tour. Therefore below I am giving a link to find your bus and you can also check the availability of the bus seats and book it online. So click here to book bus online, and you can also pay for it by credit cards, Debit cards and internet banking. So now it is easy to book your bus online for Uttarakhand. For more details about Uttarakhand transport department check the website: - http://transport.uk.gov.in.